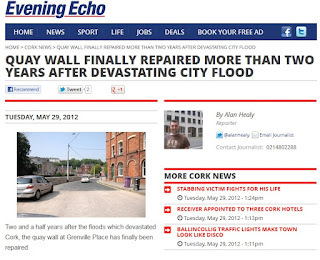 The Evening Echo reports that after two and a half long years, the repair works to Grenville Place in Cork City are finally complete. The quay wall was partially demolished here during the flooding of 2009. The roadway is directly adjacent to the former home of George Boole, a building which partially collapsed in October 2010. Since then there has been pressure on those responsible, including Cork City Council to save the building and protect Cork's cultural, historic and scientific heritage. Since Cork City Council had earlier stated that it would "subject to the consent of the owner, establish the level of interest in its future use/development, from the range of bodies which have expressed views to the Council on its historic importance" and given that the building now seems to be for sale on the open market, it's time to act. The rebuilding of the quay wall was suggested as an obstacle to progressing the project. That obstacle has now, finally been cleared. Given the length of time taken to deal with the quay wall, I won't hold my breath but Cork City Council and those responsible for the building's present condition would do well to hear that it hasn't gone away, you know.